Metabolic syndrome is not a disease, but a clustering or “constellation” of health markers. Although there are several definitions of what is required to be diagnosed with metabolic syndrome, in the United States most health care professionals use criteria from the National Heart, Lung, and Blood Institute (NHLBI) and the American Heart Association. A waist measurement of more than 35 inches around (more than 40 inches in men). A fasting blood glucose level of 100 mg/dL or higher; or you’re already taking medication because you have high blood glucose levels. A triglyceride level at or above 150 mg/dL. Triglycerides are a form of fat in your blood. An HDL cholesterol level (the “good” cholesterol) below 50 mg/dL (below 40 mg/dL in men); or you’re already taking medication to increase your HDL level. A blood pressure at or above 130 mm Hg systolic (the top number) or 85 mm Hg diastolic (the bottom number); or you’re already taking medication to treat high blood pressure. According to the American Heart Association, 47 million Americans have metabolic syndrome, although many may not know it. Metabolic syndrome is a concern because it is linked to several health conditions, particularly heart disease and diabetes. Although rates of metabolic syndrome are the same in men and women, women with a condition called polycystic ovary syndrome (PCOS) are up to 11 times more likely to have metabolic syndrome than those without PCOS. Additionally, rates of metabolic syndrome increase with age, occurring in about 45 percent of those aged 60 to 69. Researchers have discovered the risk of metabolic syndrome in women begins to rise around perimenopause, which seems to be related to increases in testosterone at that time. The reason so many Americans have metabolic syndrome is related to three things: weight, lack of exercise and genetics. However, while you’re more likely to have metabolic syndrome if you’re overweight, not everyone who is overweight has it. And you can have it even if you are not overweight. 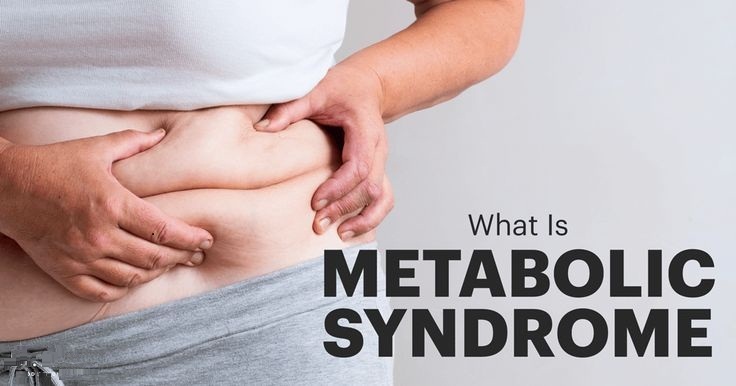 Estimates are that about 22 percent of overweight and 60 percent of obese people have metabolic syndrome, with the risk thought to be directly related to the amount of abdominal fat. Abdominal, or visceral, fat is defined by your waist circumference. Later, we’ll talk more about why this increases your risk for certain diseases. You also have a higher risk of metabolic syndrome if you’re Hispanic or South Asian (from the Indian subcontinent), don’t get much or any exercise and follow a high-fat diet, particularly one high in fried foods, carbohydrates and so-called “empty calories” like soda. Conversely, following a diet high in whole grains and unsaturated fats, as well as mild-to-moderate alcohol consumption, can reduce your risk. Metabolic syndrome can also be a side effect of antipsychotic medications, especially the drug clozapine (Clozaril). Even as the incidence of metabolic syndrome is increasing in adults, it is also rising in adolescents. Today, about 9 percent of adolescents over the age of 12 fit the definition of metabolic syndrome. This includes 19 percent of Native Americans and 13 percent of Mexican-Americans. The more overweight teens are, the more likely they are to have metabolic syndrome. For instance, 39 to 50 percent of those considered obese for their age have metabolic syndrome. Although you’re much more likely to have metabolic syndrome if you’re overweight or obese, you can have it even if you have a normal weight. The most important risk factor is the amount of fat around your abdomen, called visceral fat. This visceral fattends to accumulate more in women after menopause. Visceral fat produces hormones and other chemicals that change the way certain systems in your body work. For instance, they increase the amount of inflammation in blood vessels, which can lead to a buildup of plaque on vessel walls. Eventually, pieces of plaque can break off and clog blood vessels, or blood clots can form and clog vessels, causing a heart attack. Studies find that your risk of cardiovascular disease (CVD) doubles if you have metabolic syndrome, and you are more likely to die from CVD if you have metabolic syndrome. Additionally, you are significantly more likely to develop atherosclerosis, a buildup of plaque in your coronary arteries that contributes to heart disease, stroke and peripheral vascular disease (PVD). Components of metabolic syndrome also lead to insulin resistance. Insulin is a hormone required to get cells to open up and let glucose in. Insulin resistance occurs when cells don’t have enough insulin receptors (the “lock” into which the “key” of insulin fits), or the insulin receptors don’t work properly. Maybe they’re not formed right or maybe they’re just stubborn and won’t let glucose into the cells. That’s why they’re called “resistant” to insulin. The result? Glucose builds up in your bloodstream. Eventually, this can turn into type 2 diabetes. While metabolic syndrome is not a direct cause of diabetes, it is a strong predictor of the disease. If you have metabolic syndrome, your risk of developing diabetes is two and a half to four times greater than someone who does not have the condition. And the more risk factors you have for metabolic syndrome, the more likely you are to develop diabetes. Researchers are also finding links between metabolic syndrome and nonalcoholic fatty liver disease (NAFLD), chronic kidney disease, dementia and obstructive sleep apnea. Metabolic syndrome is a very complicated condition to diagnose. The only visible symptom of metabolic syndrome is being overweight, but that is no guarantee that you’ll have the condition. And you can have metabolic syndrome even if you aren’t overweight. There are at least six definitions for metabolic syndrome. The primary one used in the United States comes from the National Heart, Lung, and Blood Institute (NHLBI). The chart shows the differences among the definitions. The WHO, for instance, requires evidence of insulin resistance or diabetes to make a diagnosis of metabolic syndrome, while the IDF requires a certain degree of abdominal obesity. The NHLBI, however, considers the five components equal in importance. The WHO’s definition is designed to identify people at greater risk for diabetes; while the NHLBI’s definition is designed to identify those with greater risk for cardiovascular disease (CVD). In the United States , there’s general agreement among medical professionals to use the NHLBI definition, in part because it’s so difficult to test individuals for insulin resistance in the typical health care provider’s office. The reality, however, is that any one of the five risk factors increases your risk of cardiovascular disease whether you have metabolic syndrome or not. So whether you have one or all five of the components, you and your health care professional need to work together to reduce that risk and any others you may have. To diagnose metabolic syndrome, your health care professional should measure the five components involved in the condition: blood pressure, blood triglyceride level, HDL cholesterol level, waist circumference and fasting blood glucose level. You will need to fast for at least 12 hours before the blood tests. If you have polycystic ovary syndrome, or PCOS, you should ask your health care professional to evaluate you for metabolic syndrome. This condition affects between 6.5 and 8 percent of women of childbearing age. Typical symptoms include irregular or absent menstruation, obesity and hair on the face and other parts of the body where women typically don’t have much hair, a condition called hirsutism. Women with PCOS also often have high levels of testosterone and often have trouble getting pregnant. Some research finds that women with PCOS are up to 11 times more likely to have metabolic syndrome. What we don’t know is whether the components of metabolic syndrome cause the PCOS or vice versa. But women with PCOS tend to be overweight, have insulin resistance, have high levels of fasting blood glucose and, in fact, a much higher risk overall of cardiovascular disease and diabetes. The cornerstone of treatment for metabolic syndrome is simple: improving your diet, restricting calories, losing weight and/or maintaining a normal body weight and increasing levels of physical activity. Losing as little as 5 to 10 percent of your body weight can reduce blood pressure and insulin levels and decrease your risk for diabetes. Don’t try a crash diet, however; they don’t work. Instead, the best approach is to reduce your total calories. You can cut out 500 calories a day, for instance, simply by skipping that Frappuccino and cutting out one large soda. Cutting calories isn’t enough, however, if you’re after long-term weight loss. You also have to change the way you eat and view food. That means setting goals for weight loss, planning meals, reading labels, reducing portion sizes and avoiding eating binges. Measuring and cutting calories can be complicated, so you might try simpler techniques like setting aside 10 percent of your meal before you even start. You’ll eat less and not even notice the difference. And you don’t have to lose a lot of weight; aim for 5 to 10 percent of your weight over six to 12 months. If you weigh 200 pounds, that’s a loss of 10 to 20 pounds, enough to change the way you look and feel and improve many of those metabolic markers. Even if you’re not aiming to lose weight, you should change your diet. Studies find a diet high in saturated fat, simple sugars and cholesterol contributes to metabolic syndrome. Reducing the amount you eat while increasing the fruits, vegetables and whole grains in your diet is best. The Mediterranean Diet, which is high in fruits, vegetables, nuts, whole grains and olive oil. In a study that compared the Mediterranean diet with a standard low-fat diet, participants who ate the Mediterranean experienced greater weight loss, lower blood pressure, lower markers of inflammation and improved insulin resistance and lipid profiles. The D.A.S.H. diet, which includes a sodium intake of less than 2,400 mg per day and a higher dairy intake than the Mediterranean diet. When compared with a weight-reducing diet that emphasized healthy food choices, the D.A.S.H. diet resulted in greater improvements in fasting glucose, triglycerides and diastolic blood pressure, even after controlling for weight loss. A low-glycemic diet, which includes foods with a low glycemic index and replaces refined grains with whole grains, fruits and vegetables and eliminates high-glycemic beverages. A low-glycemic diet appears to be particularly beneficial for people with metabolic syndrome; however, experts aren’t sure if it is the low glycemic index itself or the increase in high-fiber foods that produces the beneficial effects. Now on to the second part of the equation: exercise. When you exercise, your cells become more receptive to insulin. Even if you don’t lose weight, regular exercise (a 30-minute walk a day) can make a huge difference in improving most, if not all, of the risk factors for metabolic syndrome. Although lifestyle changes are the simplest and most effective way to improve all five risk factors associated with metabolic syndrome, in some instances your health care provider may also prescribe medication to treat the individual components of metabolic syndrome. To improve insulin resistance, for instance, your health care professional may prescribe medications such as metformin (Glucophage), pioglitazone (Actos) and rosiglitazone (Avandia). In fact, studies find that metformin can help prevent diabetes in people with prediabetes. If you have both high blood pressure and metabolic syndrome, make sure your health care professional knows you have the syndrome. Large doses of some commonly prescribed blood pressure drugs, such as diuretics and beta-blockers, can make insulin resistance worse. ACE inhibitors such as enalapril (Vasotec) and benazepril (Lotensin) and angiotensin receptor blockers like losartan (Cozaar) seem to work best in patients with diabetes. While there aren’t many drugs that can raise HDL cholesterol, your health care professional may still prescribe a statin, particularly if your LDL cholesterol levels are high; statins can improve HDL cholesterol somewhat. Additionally, if your 10-year risk of heart disease is high, you may want to talk to your health care professional about aspirin therapy. You can learn more about your risk of heart disease at www.nhlbi.nih.gov/guidelines/cholesterol/risk_tbl.htm. Drugs may be prescribed in combination with a healthy diet to reduce high triglycerides. Prescription drugs include omega-3 fatty acids (Lovaza) and the fibrates gemfibrozil (Lopid) and clofibrate (Atromid-S). Talk to your health care provider about the risks and benefits of these drugs, based on your personal medical history. Generally, your primary care physician—family practitioner or internist—will treat the components of metabolic syndrome, although you may also need to see an endocrinologist, a doctor who specializes in diseases like diabetes that are related to hormones. The best way to prevent metabolic syndrome is identical to the treatment for the condition: maintaining a healthy weight, incorporating at least 30 minutes of physical activity into your day and following a healthy diet high in fruits, vegetables and whole grains and low in sugar and fat. A good place to start is to have a conversation with your health care professional about weight management, weight-related health issues, your personal health risks and the health screenings you should be sure to have. Metabolic syndrome is not a disease, but a clustering or “constellation” of health markers. Your waist measures more than 35 inches around (more than 40 inches in men). Your fasting blood glucose is 100 mg/dL or higher; or you’re already taking medication because you have high blood glucose levels. You have a triglyceride level at or above 150 mg/dL. Your HDL cholesterol level (the “good” cholesterol) is at or below 50 mg/dL (at or below 40 mg/dL in men); or you’re already taking medication to increase your HDL level. Your blood pressure is at or above 130 mm Hg systolic (the top number) or 85 mm Hg diastolic (the bottom number); or you’re already taking medication to treat high blood pressure. About 47 million Americans have metabolic syndrome, although many may not know it, according to the American Heart Association. Women with a condition called polycystic ovary syndrome (PCOS) are up to 11 times more likely to have metabolic syndrome than those without PCOS. The risk of metabolic syndrome increases with age. Researchers have discovered the risk of metabolic syndrome in women begins to rise around perimenopause, which seems to be related to increases in testosterone. Although you’re much more likely to have metabolic syndrome if you’re overweight or obese, you can have it even if you have a normal weight. The most important risk factor is the amount of fat around your abdomen, called visceral fat. This visceral fat tends to accumulate more in women. Metabolic syndrome significantly increases your risk of developing heart disease and diabetes and has been linked to liver disease, chronic kidney disease, sleep apnea and dementia. The only overt symptom of metabolic syndrome is being overweight. The best way to treat metabolic syndrome is by losing weight and maintaining a healthy weight, becoming physically active and following a healthy diet. This is the only thing you can do that will improve all health markers for metabolic syndrome. Your health care professional may prescribe medication to treat the individual components of metabolic syndrome, such as antihypertensives for high blood pressure and certain anti-diabetes drugs to improve insulin resistance. Do I really need to worry about metabolic syndrome?While metabolic syndrome itself isn’t a disease that will make you sick or kill you, it is a sign that you have a much higher risk of other diseases that will, such as heart disease and diabetes. Think of it as a warning sign that it’s time to get serious about things like diet and exercise. My friend’s doctor says that metabolic syndrome is very controversial among medical professionals. Why?Health care professionals don’t always agree on everything, and metabolic syndrome is one of those things. Some health care professionals don’t see the value in identifying the syndrome in patients, because it isn’t itself a disease; others feel that not identifying it is irresponsible, because it is associated with other diseases, perhaps down the line. Whether or not your health care professional gives you a diagnosis of metabolic syndrome, it is important that you are aware of its components, since any one of the five components can increase your risk of heart disease and/or diabetes. How will I know if I have metabolic syndrome?Ask your health care professional to do the following: Measure your blood pressure and your waist circumference, perform a fasting blood glucose test and test your triglyceride and HDL cholesterol levels. If you have any three of the following—a waist measurement more than 35 inches around; a fasting blood glucose test level of 100 mg/dL or higher; a triglyceride level at or above 150 mg/dL; an HDL cholesterol level (the “good” cholesterol) below 50 mg/dL; or a blood pressure at or above 130/85 mm Hg—then you have metabolic syndrome. Why isn’t there a single medication to treat metabolic syndrome?Because the markers for metabolic syndrome are so diverse, it’s doubtful one medication could address them all. However, medications are available for several of the individual components, including high blood pressure, high triglycerides and low HDL. Why are exercise and diet so important in treating metabolic syndrome?When you follow a healthy diet and increase your physical activity, nearly every component of metabolic syndrome improves, even if you don’t lose weight. Exercise makes your cells more receptive to insulin, the hormone that “unlocks” cells to allow glucose inside; thus your blood glucose levels drop. Exercise also increases HDL cholesterol and reduces triglycerides and can reduce blood pressure. Changing your diet from one high in fat and sugar to one high in vegetables and fruits, along with whole grains and lean protein, also changes levels of blood fats like triglycerides while reducing blood pressure. Finally, both these things—more exercise and a better diet—usually lead to weight loss, even if you’re not trying! And weight loss will improve every parameter of metabolic syndrome. Why are women with PCOS so much more likely to have metabolic syndrome?We know that women with PCOS, or polycystic ovary syndrome, a hormone disorder that can lead to infertility and diabetes, are up to 11 times more likely to have metabolic syndrome. What we don’t know is whether the components of metabolic syndrome cause the PCOS or vice versa. But women with PCOS tend to be overweight, have insulin resistance, have high levels of fasting blood glucose and, in fact, have a much higher risk overall of cardiovascular disease. The condition affects 6.5 to 8 percent of women of childbearing age, and most have one or more of the classic features: irregular or absent menstruation, obesity and hair on the face and other parts of the body where women typically don’t have much hair.